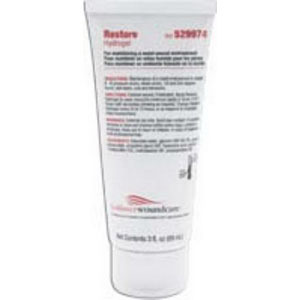 Restore® Hydrogel impregnated dressing is easy to handle and apply as supplied in a clear, viscous gel. Cost effective and clinically shown to last up to 72 hours. Conveniently supplied in a variety of forms to meet differing clinical needs. Easy to handle and apply as supplied in a clear, viscous gel. Cost effective and clinically shown to last up to 72-hour. Conveniently supplied in a variety of forms to meet differing clinical needs.